Robert Joseph Cox was born on 21st May 1941, in Tulsa, Oklahoma USA, and is a former professional baseball player and manager. He played just two seasons as third baseman with the Major League Baseball team the New York Yankees from 1968 to 1969. Subsequently Cox worked as a manager at Atlanta Braves from 1978 to 1981 and from 1990 to 2010, and he also managed Toronto Blue Jays from 1982 to 1985. He won the 1995 World Series and was inducted into the Baseball Hall of Fame in 2014. Cox retired in 2010. Have you ever wondered how rich Bobby Cox is, as of late 2016? According to authoritative sources, it has been estimated that Cox’s net worth is as high as $45 million, an amount earned largely through his successful career as a baseball manager. In addition to being a player and manager, Cox also worked as General Manager, which also improved his wealth. Bobby Cox grew up in Oklahoma, but later moved to California where he went to the Selma High School in the San Joaquin Valley. He signed an amateur contract with the Los Angeles Dodgers in 1959, where he spent five seasons as a second baseman and third baseman. The Chicago Cubs drafted Cox in 1964, but he was traded to the Atlanta Braves in 1966, and later moved to the New York Yankees in 1967. Cox played two seasons for the Yankees, mostly as the third baseman, but knee injuries prevented him from continuing his playing career, so he retired from the MLB in 1969. However, Cox played baseball in the Venezuelan Winter League, representing the Cardenales de Lara and Leones del Caracas from 1967 to 1970, and later started his managerial career with the Cardenales from 1974 to 1977, while in 1977, he served as the first base coach with the Yankees. In 1978, he took over at the Atlanta Braves but wasn’t successful in his first two seasons, being placed last in the league. However, thanks to Cox’s skills and the talent of Dale Murphy, who became one of the league’s best players, Atlanta finished fourth in 1980, which was their first season above .500 since 1974. In 1981, the owner Ted Turner fired Cox after the baseball strike and replaced him with Joe Torre. Cox ended his first stint with the Braves with a 266-323 record in regular season, but his net worth was established. Cox joined the Toronto Blue Jays in 1982 and drastically improved them over the four years of his management, and ended his Blue Jays days with a record of 355 wins and 292 defeats. From 1985 to 1990, Cox served as the Atlanta Braves General Manager, but in 1990 he fired Russ Nixon and appointed himself as the new manager. In the next season, Cox led the Braves to the World Series, but they lost to the Minnesota Twins in seven games. In 1992, Atlanta won the National League Championship Series against the Pittsburgh Pirates in seven games but lost to the Toronto Blue Jays in the World Series. In 1993, the Braves made the playoffs again, but this time they were stopped in the National League Championship Series by the Philadelphia Phillies in six games. However, Cox finally win the World Series in 1995 after a 4-2 win over the Cleveland Indians, which was the only title in his managerial career. The Braves were close to defending the title in 1996 in the World Series, leading the Yankees 2-0, but New York won the series 4-2. The two teams met again in the finals in 1999, with the Yankees winning again, this time they swept the series in four games. The Atlanta Braves made the playoffs several more times until 2010, but never made it through the first round. Cox’s last game was on October 11, 2010 when the Braves were defeated by the San Francisco Giants in the National League Division Series. After two stints with Atlanta, Cox’s record is 2,149 wins and 1,709 losses, while in total he has 2,504 wins and 2,001 losses in a regular season. 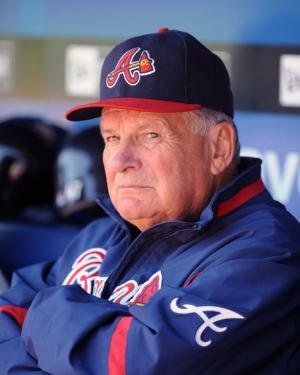 Regarding his personal life, Bobby Cox married Pamela Boswell in 1976 and has one child with her. 1 Inducted into the National Baseball Hall of Fame in 2014. 2 Has had six 100 win seasons. 3 Has won 1 World Series title, 5 National League titles, 3 National League Western Division titles, 10 National League Eastern Division titles, and 1 American League Eastern Division title. 4 Won 13 straight divisional titles with the Braves (1991-2004). His team was in second place in 1994, but the season ended with a strike and no championship was awarded, so his streak was not snapped. 5 Three-time Manager of the Year (1985 AL, 1991 NL, 2004 NL). 6 Manager of the Atlanta Braves and Toronto Blue Jays.